Overview: The Silver Palaung of Myanmar, numbering 272,000, are Engaged yet Unreached. They are part of the Mon-Khmer people cluster within the Southeast Asian Peoples affinity bloc. Globally, this group totals 282,000 in 2 countries. 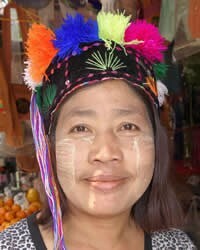 Their primary language is Ruching Palaung. The primary religion practiced by the Silver Palaung is Buddhism, a system of beliefs and practices based on the teachings of Siddhartha Gautama, commonly known as the Buddha.